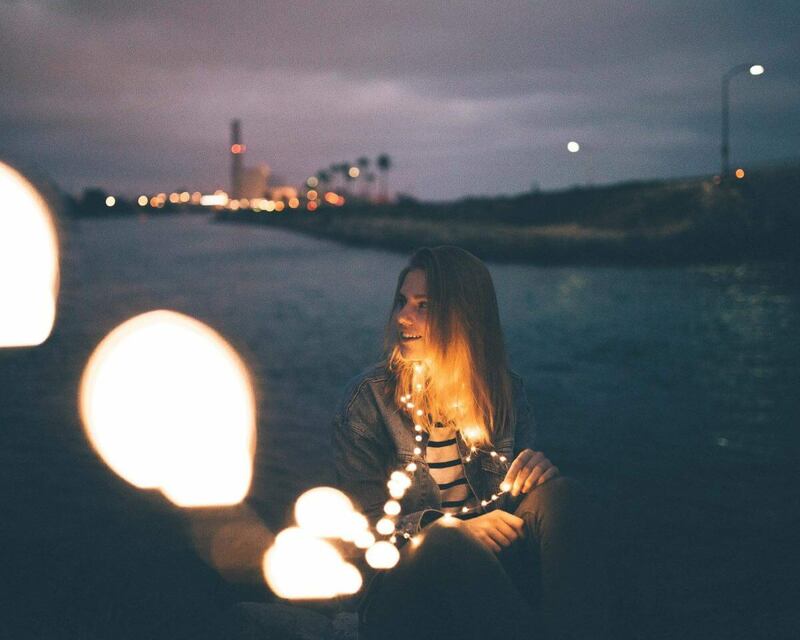 Fairy lights photography has become a growing trend amongst content creators. The string fairy lights are a great object for photography because it actually enhances the quality of photos by providing extra light while giving off a cool and creative effect. I was looking everywhere online and couldn’t find a full guide on using string lights in photography and video, so here I am after doing my deep research, creating a full guide for you to learn everything you need to know. 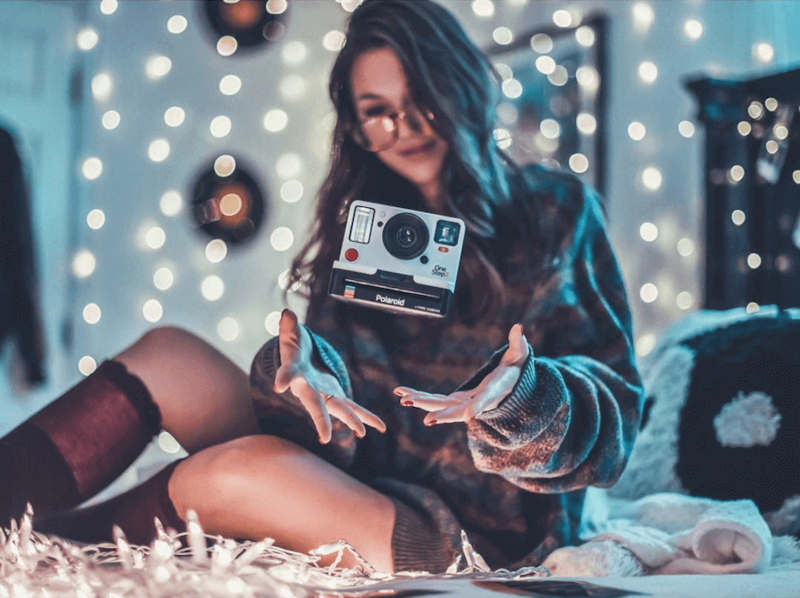 In this guide, you will learn about the best places to purchase the right fairy lights for photography, the best practices when taking photos with fairy lights, and finally some creative fairy light photography ideas that you can use on your personal photoshoots. 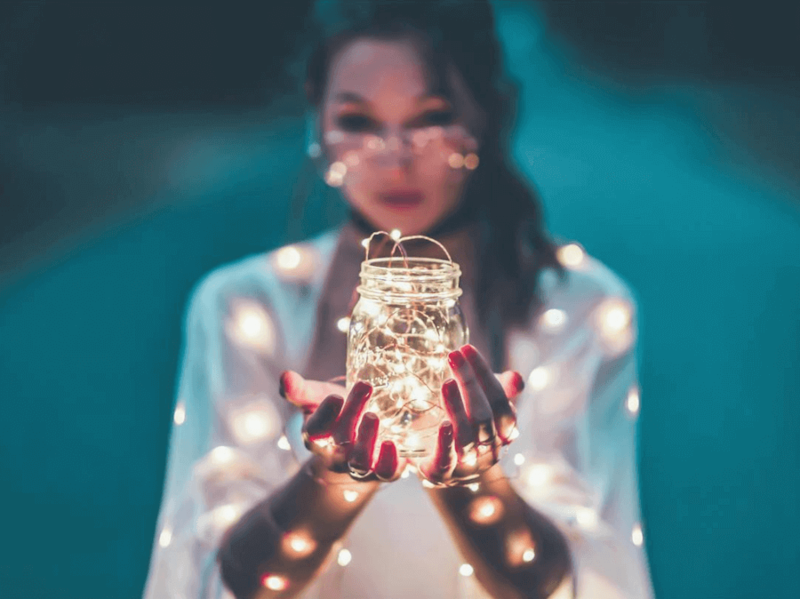 Where to Purchase the Best Fairy Lights for Photography? The one that I currently use and haven’t had a problem with are the best selling ones on Amazon. These fairy lights have over 1500 reviews at 4.5 stars on average. These are the waterproof GDEALER LED String Lights that are fairly inexpensive. These string lights allow you to adjust the brightness. This helps for darker locations and for more creative fairy light ideas. You can choose to have these lights in warm white or as multi color. These options will help you achieve the best fairy light look for your images. If you already purchased the regular string lights mainly used for portraits and to wrap around objects. You can look into getting these curtain string lights which are great if you’re looking to light up the background of an image. Here is one I recommend from Amazon and it has excellent reviews. In order to take the best photos with fairy lights, there are a few things that you should keep in mind. The most important thing when taking photos with string lights is making sure your aperture is low. For starters, aperture is how much light your lens lets into your camera and having a lower aperture gives you that nice blurry effect that turns the lights into nice round circles in your photos. Here is a beginner’s guide on aperture and depth of field to help you understand. Another thing you want to do is to make sure you are in a darker setting. Taking photos with string lights mid day when the sun is out, will not give you the best results. Either choose a dark room or wait till the sun goes down before heading outside to take your images. A big personal preference of mine when taking photos with fairy lights is to a subject. I include several ideas in the next section, but having an object can bring many benefits. I find that using the fairy lights to light up your subject make the image turn out much better. You can also use the string lights to wrap around your object and it gives you even more creative flexibility. 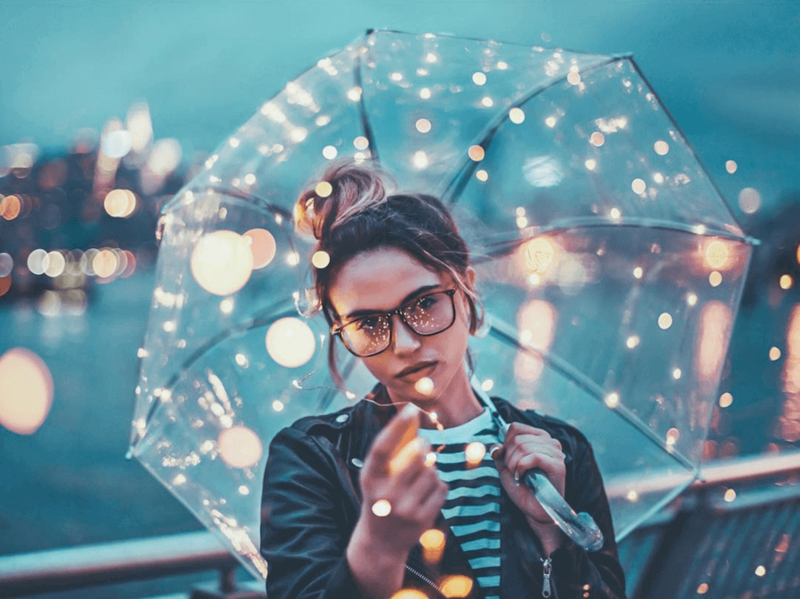 If you’ve seen fairy lights before, you probably heard of the famous Instagram photographer who goes by the name of Brandon Woelfel (@brandonwoelfel). 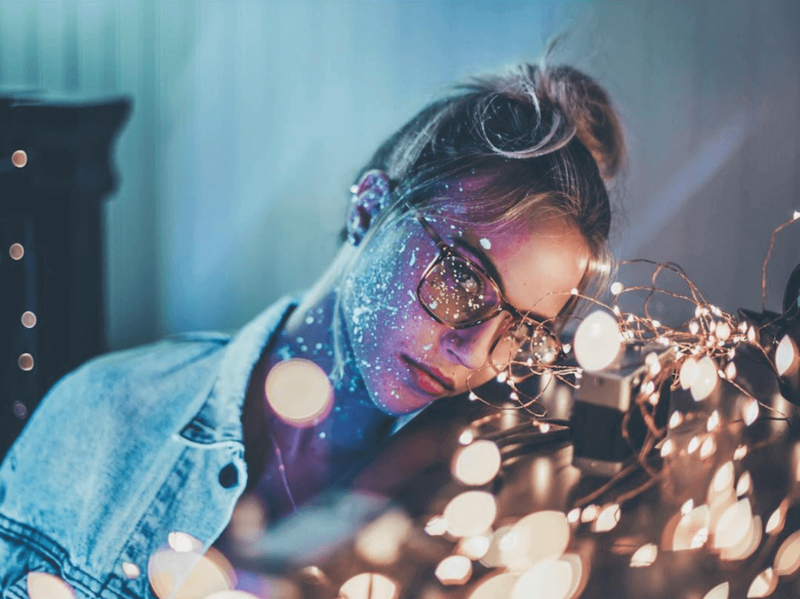 Brandon takes incredible photos with fairy lights and his editing style is amazing. 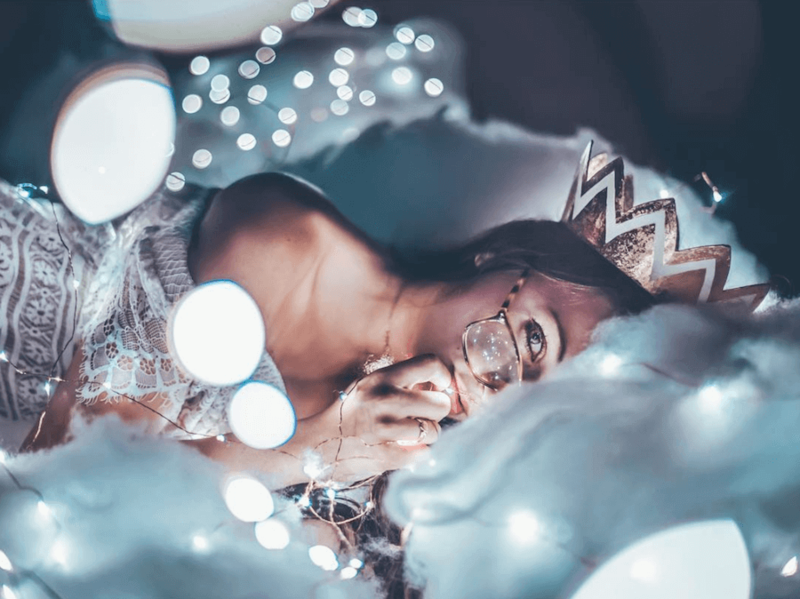 His photos are incredible and they have inspired me to compile a list of 7 ideas you can use for your fairy light photography shoots. You can start by focusing the camera on an object such as a Lensball, stained light bulb or any items used for creative photography ideas. Once you have the item in focus, you can wrap the fairy string lights around the object to illuminate item. 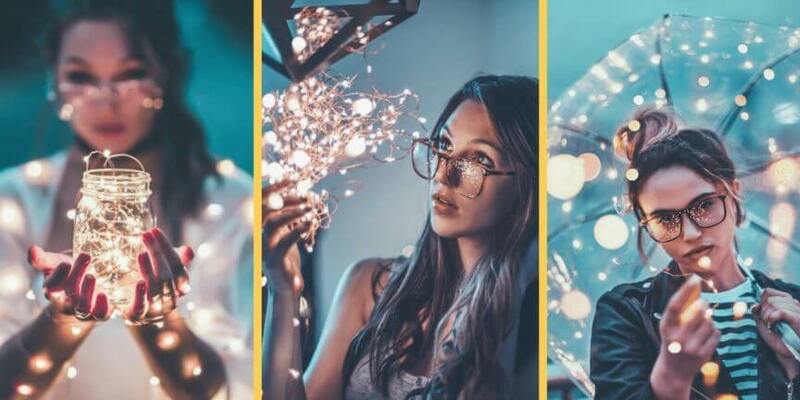 As you can see in the example from Brandon Woelfel below, he is taking this picture in a dark room, where the only source of light is from the string light. Mason jars have been used for storing items, holding beverages, and now for creative photography. 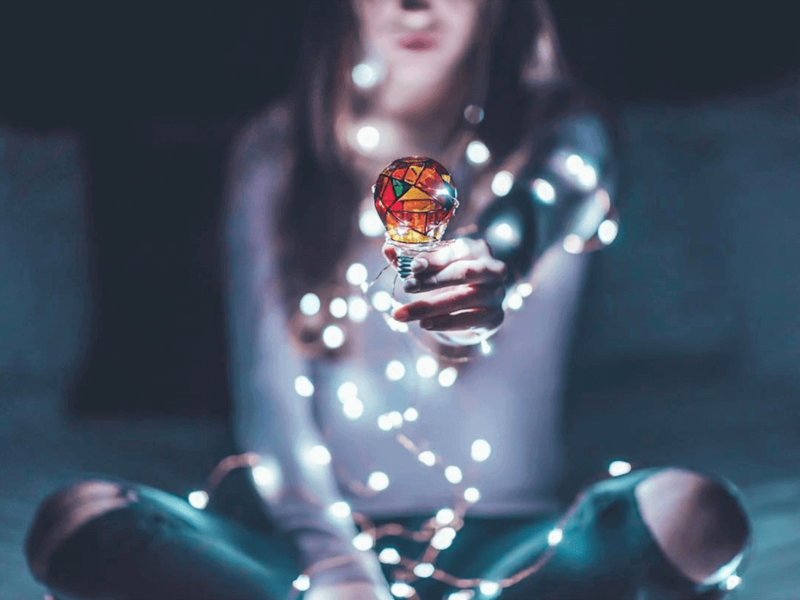 You can create stunning photos by filling your mason jar up with your string lights and watch as the jar glows up and creates an amazing object for you to take pictures of. Add a model like Brandon does and you have a photo that will leave your followers in awe. For this idea, all you need is a clear see-through umbrella and you can use your lights to wrap around the outer layer. Once again a shot like this might be better with a model to hold up the umbrella and you can let your imagination and creativity work the two together for an amazing photo. A cool effect you can do with the string light is to have the light in front of the subject. This way you can get some great bokeh in the foreground that will add another layer to your overall photo. Remember when taking these nice bokeh shots, make sure to adjust your aperture to the lowest possible setting. If it isn’t evident already, you can create some amazing portrait shots with fairy lights. Once again, the lighting from the fairy lights is spectacular, so place the lighting around the face of the model and you can create some stunning shots. Last, but not least, you can use these string lights to light up the background. If you take the photo right, you will be able to get some beautiful bokeh from the background. Not to mention, the fairy lights are also an excellent decoration for your room. Fairy string lights can definitely get you some amazing pictures for cheap and I would highly recommend you get some fairy lights off Amazon. The examples I used here are great guides and references for your photos, but you should use your own creativity to create even better shots! Have more ideas for fairy lights photography? Share them below in the comments, I would love to hear your ideas!